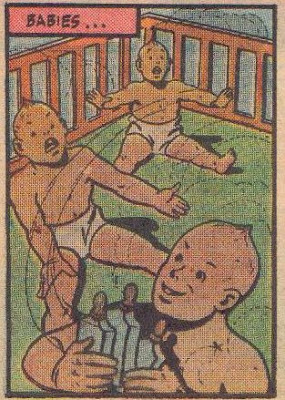 My general dissatisfaction with modern-day comics has caused me to delver deeper and deeper into the Golden Age for entertainment, and I feel very lucky that I did, because if I hadn't, I never would have read issue 64 of Fawcett's "Master Comics", and seen the greatest single panel in the history of comic books. Said panel appeared in the middle of an otherwise middling Bulletman story. For those unfamiliar with the character, Bulletman is the Flying Detective. 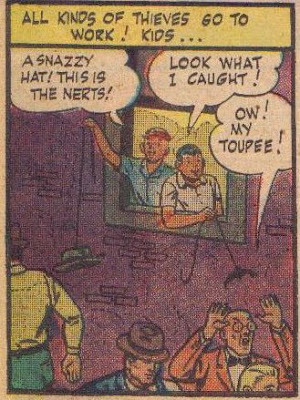 Much like (actually, exactly like) the Silver Age Flash's origin story, Jim Barr is a mild mannered police scientist who invented a 'gravity helmet' to help him fight crime. It allows him to fly, is shaped like a bullet, and has super-magnetic powers that attract bullets to it, then cause them to bounce away after impact, making him functionally bulletproof. He also made a helmet for his Girlfriend (and daughter of the police chief) Susan Kent. They have a bulletdog as well. Instead of a helmet, he wears a collar. Anyhow, in this particular story, 'Holiday for Crime', the police are stymied when a thick fog covers the city, giving criminals a chance to loot stores and rob people without being identified, or even pursued. The fog is coming from 'portable fog boxes' that a crook named Fegel stole from the Army, and now he has a ring of thieves picking the city clean. It's not just the professional thieves working the chaos, however, which brings me to the lead up to the greatest panel in the history of comics. Yes. It is the nerts. I know. I'll wait until you stop weeping with joy. How long do you suppose that dog had been coveting that bone? Days? Months? He's sat at the edge of the yard, just waiting for something like this! That poor Collie, staring ahead into the fog - she's got no idea what's going on. From there, the plot wraps up in an utterly perfuctory fashion - for a flying DETECTIVE, Jim actually does very little solving this time around. The chief summons Jim and Susan back from their vacation with a note expressing his frustration at not having Bulletman and Bulletgirl around to sort out the fog mess. Once they're in town they don't have to do any actual investigating, though - Fegel keeps calling police headquarters to gloatingly announce where he's planning to strike next, so it's just a matter of tracing the call and heading over there to arrest him. 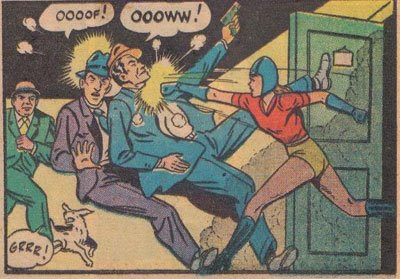 For a moment it looks like Bulletman and Bulletgirl are in trouble, but then the police show up to help them capture Fegel. Actually, come to think of it, since the police knew where he was, I'm not really sure why the Bullet team had to be called in on this one. Pretty much would have been the same story if they'd stayed on vacation. But none of that's important. 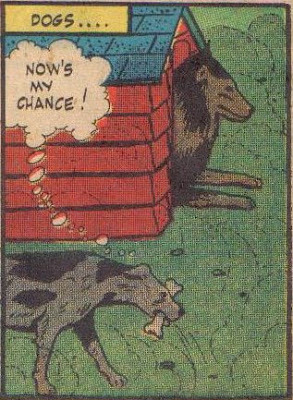 What's important is that we, the readers, were treated to the greatest of all concepts, a criminal dog, visually represented. My hat is off to you, anonymous writer and artist of this incredible story. Someday I hope to discover your true identities, so I can thank you, either in person, or in the form of flowers left at a gravesite, whichever you prefer. So now I bid you adieu, with one final look at the greatest panel in the history of comics - that's right, it's all downhill from here. Love the comic posts. Thanks.